Lock in a great price for Dar la Cle de la Medina – rated 9.5 by recent guests! I love the minimalist style of the riad and Mr. Karim who welcomed us and explained every thing that we should know in Marrakesh. Fantastic stay - the staff was extremely warm and welcoming. We organized the airport transfer through them for 10 euros, and the staff came out to meet our taxi to show us to the riad (since the riad is deep in the Medina where it is hard for cars to get through the markets). Along the way, we were shown where to exchange our money for the best exchange rate as well as a place we could buy sim cards. The breakfast was delicious - when we had to leave early one morning, they graciously woke up earlier to provide the breakfast for us - truly above and beyond. The rooms were beautiful and spacious, and even though we were only steps away from the markets, once you were in the riad it was peaceful and quiet. We felt safe the entire time we were there, and when we had to leave early in the morning for our Sahara tour, the staff graciously walked us to our meeting spot and waited until we were picked up by our driver. What's not to like of this place! 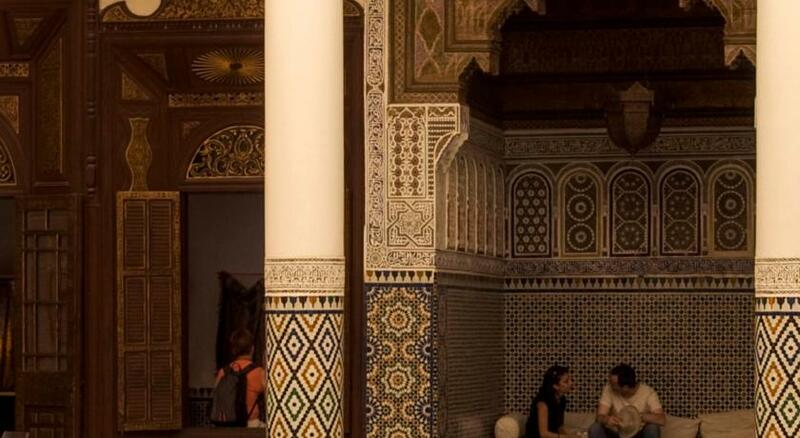 The traditional Moroccan architecture without missing details. The terrace offering great views of the city. The warm and yummy breakfast. A constant reminder that you are in vacations and deserve the best! Karim was an excellent host, offering excellent hospitality and advice. Comfortable bed, very quiet, beautiful rooftop terrace, heater in room and bathroom, very nice breakfasts. Good location for exploring Marrakech. Key for riad and room. Good wifi. Staff was the best, picked us up so we wouldn't get lost. Karim is the best! Everything! The Riad was beautiful and stylishly decorated, our room was lovely and the breakfast on the top terrace in the sun was great. Karim the front of house guy was so helpful and friendly, he really made us feel welcome and organised a home cooked tajine meal for us to have at the riad on of the nights, thanks Karim. We went in march and there was a heater in the room, we only used it once. Our little boy is 3 and he loved it too, splashing in the little pool. Definitely recommend, an authentic Moroccan riad experience. Karim is a great manager. Helps you with everything you need. Location cant be better but take the airport transfer so he can show you the way. The Riad in real is even more beautifull then on the pictures. The breakfast is a bit different everyday, just great! Very good location and useful hints from staff about life and exploring Marrakech. Flexible time of served breakfast. The Hotel Manager Karim is very kind, helpful and always there if you need help. He is reliable and smart. They organised an airport transfer and Karim picked us up at the meeting point where the taxi driver drop us off. He had great tips for us and he made a few calls with our tour guides to confirm pick up places and times. He always made us tea and brought us handmade cookies. The Riad is very central. It's very close to the famous Café du France and Jemaa el-fna. We would definitely stay here again! One of our best sellers in Marrakesh! 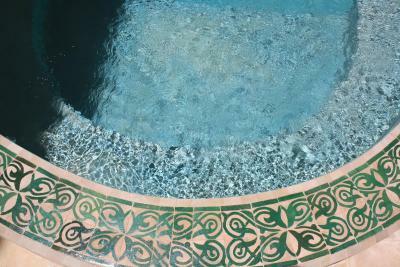 A 3-minute walk from Jemaa El Fna Square, Dar la Cle de la Medina offers a patio with a seating area, a plunge pool, a furnished terrace, a garden, free Wi-Fi and a traditional Moroccan lounge with a fireplace. The rooms and suites feature a seating area, a wardrobe and tiled floors. They also include a private bathroom with a bath tub or shower and toilet. One of the suites also has a terrace. A traditional breakfast is available daily and guests can enjoy a variety of regional specialties in the dining area. Dar la Cle de la Medina can organize excursions in the surrounding area, and beauty treatments. 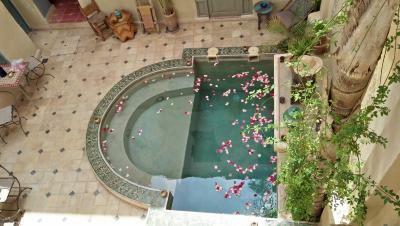 뀐 Located in the real heart of Marrakesh, this property has an excellent location score of 9.8! When would you like to stay at Dar la Cle de la Medina? This room is set by the patio, featuring a pool view, Moroccan lounge, a wardrobe and tiled floors. It also includes a private tadelakt bathroom with a shower. This room features a Moroccan lounge, cedarwood furniture and wooden ceilings. It also includes a private bathroom with a bathtub and toilet. This spacious suite features a Moroccan lounge, painted wooden ceilings and a view of the patio. It also includes a private tadelakt bathroom with a bathtub and toilet. This suite is entirely modeled in tadelakt and features a private terrace furnished with a Moroccan lounge, overlooking the patio. It also includes a reading area and a private bathroom with a bathtub and toilet. House Rules Dar la Cle de la Medina takes special requests – add in the next step! For any request about an extra bed please contact the property in advance. Please inform Dar la Cle de la Medina of your expected arrival time in advance. You can use the Special Requests box when booking, or contact the property directly using the contact details in your confirmation. Quite hard to find but we are not very good with directions! The airport shuttle guy was late and we couldn't get back in the airport to get a drink of water for our 3 year old. The shower is old but we always had hot water. We didn't get fresh towels but we didn't ask for new ones. The owner was a really nice and helpful person, he spoke very good english and french. He was flexible and helped arrange the arrival and departure. The breakfast was wonderful. The ambiance of the hotel is fabulous. It is in the middle of the medina. Thank you! The shower sometimes ran out of hot water, and the water in both the shower and sink were slow to drain (though this seems to be a recurring problem almost everywhere we stayed in Morocco). Be prepared with euros or Dirham as credit cards are not accepted. Also, access is by foot and being in the middle of the souks, there's a lot of foot traffic, be mindful of how much luggage you bring. The manager Karim is super nice and will help you with anything you need! Cozy oasis in the center of the Medina. We would definitely come back here! It was a very nice experience👍Excellent breafast.